I don’t think it’s possible to be surprised anymore by the inverse relationship between the laughs a show on Cartoon Network’s Adult Swim can elicit and the dirty feelings of shame and guilt you have afterward for having laughed so hard at said show. This is the stuff that your stoner buddies laugh at, not you, no sir/ma’am, you’re a grown-up, stop giggling, no, Squid Billies is stoopid, haha. This is lowest common denominator stuff we’re talking about, and yet for the most part, the shows that Adult Swim has famously branded of late, like Tim and Eric Awesome Show and Metalocalypse, are so absurd, so determined in their quest to both alienate their audience and win them over with their juvenile Dada sensibility that it’s pretty impossible to resist them. Still, it comes as a major relief when you across something like Eagleheart that is at least superficially smart enough that you don’t feel like you’ve totally regressed back to an especially gawky and unsentimental high school version of yourself, zits, raging hormones, bad haircut, and all. The restraint that episode writer Michael Koman shows in that sense is more refreshing than limiting, which is a very good thing for a slight, goofy cop pastiche that’s trying to appeal to a perpetually jaded fanbase that most likely has already seen all six episodes of Garth Marengthi’s Darkplace and watched all the episodes of Spaced before Hot Fuzz, maybe even before Shaun of the Dead, and in general imagines they’ve seen every other high-concept action parody they’d care to think of. I write that as someone that’s occasionally guilty of similar charges of unearned nerdy elitism, but I was still pleasantly surprised by Eagleheart. Getting past viewers’ loaded expectations is a crucial step for Eagleheart’s creators and one that Koman and episode director Jason Woliner do fairly well. 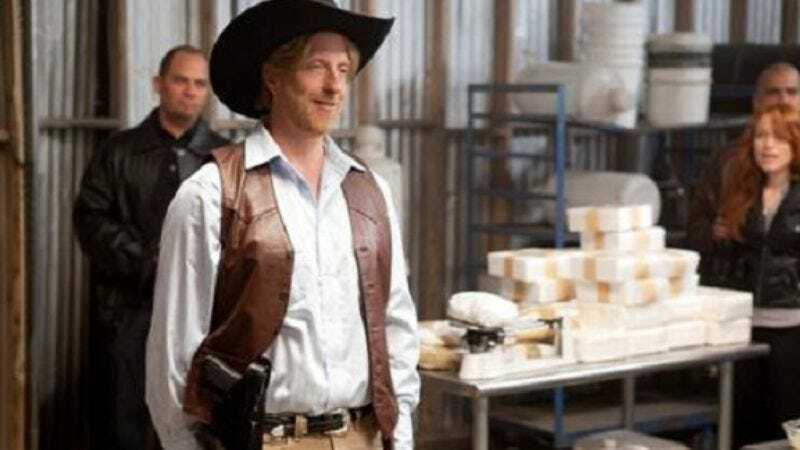 The pilot episode stars Chris Elliott as Marshal Chris, an alternately swaggering and bumbling, single-minded action hero whose partners all wind up dead after several failed attempts at confronting evil crime lord Vargas (Roger Guenveur Smith). Chris steals the look of each one of his partners after each of them gets shot by Vargas right after they walk into his private airplane hangar. The sequence where Chris and partner Trace Domino, then Diamond Gene, then Wishbone repeat their lines over and over is a fairly well-executed meta-joke about generic predictability and expectations. What makes that simple gag funny then is the timing of it. Even before it starts to happen three times in a row, we already know Chris is going walk through that door, screw up his cocky line of choice and then watch his partner get shot. Woliner accordingly makes this scene run at a brisk clip that doesn’t slow up for the rest of the episode. Each interchangeable partner shows up, poses, then dies, so that when finally Trace Domino, the last of those partners, doesn’t immediately die, you get confused. Then he and Chris practice the “Leapfrog” maneuver and Gene accidentally jumps into the active propellers of a propeller plane and only then dies. The immediacy of that sight gag—the fact that you’re not quite sure you’ve seen what you’ve seen right there and then—is what makes the joke and the scene funny, even if it’s hardly ground-breaking comedy. Still, it is rather effective, and that’s really most of what matters when you’re watching an Adult Swim show. After that scene, Koman and Woliner do their best to lose their audience. For the most part, they succeed at fostering the whirlwind pace Eagleheart’s gags need to succeed. Chris has to help Vargas, who doesn’t die after being beaten severely with Gene’s severed leg, get through physical therapy and get his basic mental faculties back so that Chris can kill Vargas and feel good about himself for doing it. It’s hard not to laugh at the bizarre montage sequence where Chris puts Vargas through the motions, teaching him the alphabet while Vargas swallows a stick of chalk, in order to avenge the aforementioned wall of “Unavenged” cops. It helps a lot that Smith, a character actor in a couple of Spike Lee films like Malcolm X and Get on the Bus, is a gifted comic actor and does a rather good Nordberg, ala O.J. Simpson, impression, bug eyes and all. But in general, cartoon-like speed is what makes Eagleheart an Adult Swim show that you don’t have to be ashamed about enjoying.